Wherever you reside, we welcome you. Gather around the table, the back patio, or the bar. Each glass, every bottle, is an invitation to settle in. noun: a place where liquor is manufactured. Before a finished spirit enters the bottle, it is born of water and grain. Some spirits, such as vodka and gin, spend a relatively short time undergoing fermentation and distillation before being ready for consumption. Aged spirits, such as our whiskey, brandy, and aquavit take longer to mature and need time to rest quietly in charred oak barrels before they are enjoyed. At the heart of the process, distillation is the blend of art and science; a practice where we strive to be harmonious with yeast, a single celled living organism, in our effort to create a symphony of flavors that will become a distilled spirit. 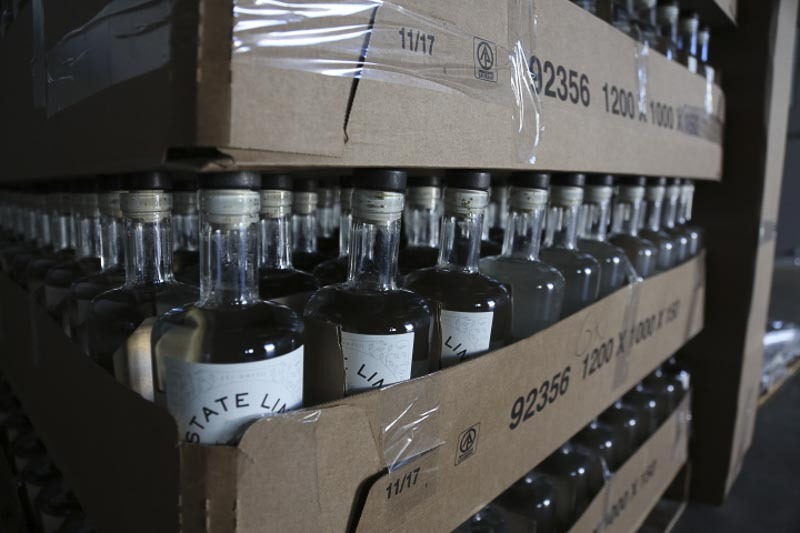 At State Line our mission is to create the highest quality, grain-to-glass spirits for you. It is our belief that above all, we must do things the proper way, every time so we are able to proudly stand behind the spirits we create. In the State Line Cocktail Lounge we invite you to settle in with friends and enjoy a different kind of cocktail experience. Fresh ingredients. Attention to detail. Our knowledgeable and friendly staff look forward to welcoming you to our space. Cheers!